Medhananda, 1908-94, born in Pforzheim, Germany, studied international and ecclesiastic law at Munich, Heidelberg, and Paris. In 1934 he left Germany with his French wife to escape the rise of Nazism. They settled on the island of Moorea in French Polynesia where they raised coffee and vanilla. During the war he was interned near Tahiti as an enemy alien. After his release in 1946 he first came across the writings of Sri Aurobindo, and in 1952 joined the Sri Aurobindo Ashram where he was put in charge of the Sri Aurobindo Library. He was co-editor of the journal Equals One, and co-founder, with Dr. Yvonne Artaud, of the Identity Research Institute, a non-profit foundation for psychological research. In the early 1980s he started an in-depth exploration of the symbology of the hieroglyphs and pictorial imagery of ancient Egypt, using the psychological approach which Sri Aurobindo had initiated for his interpretation of the Vedas. Dr. Yvonne Artaud, born 1924 at Lyon, France, was a surgeon-dentist for young children in Paris before she joined the Sri Aurobindo Ashram in 1952. Author of numerous studies on animal psychology and early-childhood education, she created several innovative teaching-learning materials including the "Aurograms", a symbol language to be used as a means of self-expression and communication by children from different linguistic backgrounds. She was Medhananda's amanuensis and editor and his partner in all his Egyptian research. One of his disciples, a sadhak of German origin to whom the Mother gave the name "Medhananda" when he joined the Ashram in 1952, was ideally equipped to take up this hint and to explore it further. Those who would like to know more about the life and background of this remarkable man could refer to the collection of autobiographical material, On the Shores of Infinity, put together from recorded conversations and notebooks by his co-worker and amanuensis Yvonne Artaud. Here, it is enough to say that from a very young age the brilliant scholar was fascinated by the myths and symbols of many different world cultures, and that both his education and his own gifts had equipped him to make profound studies in this area. He also had an intense inner life from his very childhood, which finally brought him into contact with Sri Aurobindo through the book The Mother which he found in French translation in a bookshop in postwar Tahiti. When he came to the Ashram the Mother put Medhananda in charge of the Sri Aurobindo Library, and in addition to his other duties for many years he taught classes in Comparative Religion at the Sri Aurobindo International Centre of Education. The teachings of Sri Aurobindo and his own temperament led him readily to take a psychological approach to the symbolic myths and images of ancient cultures. In his conversations and notebooks we find unusual insights into the deeper psychological significances of the Babylonian epic of Gilgamesh, classical myths of Greece and Rome, Germanic sagas and legends, and the pre-Christian culture of Polynesia, as well as tales from Buddhist, Jewish, Hindu traditions and the early Christian Gnostics. Some of these perceptions appeared in the various issues of Equals One, the journal of which Medhananda was editor and main author (under a series of playful yet significant pseudonyms) from 1964 to 1975. It was in the early 1980s that, with the help of Yvonne Artaud, he began to put together a series of systematic studies on Ancient Egyptian images, in which he found a key to a deep psychological message, comparable in some ways to that of the ancient rishis. A portion of these studies has now been published as a set of five books. This can be taken as the mission statement of the entire series. 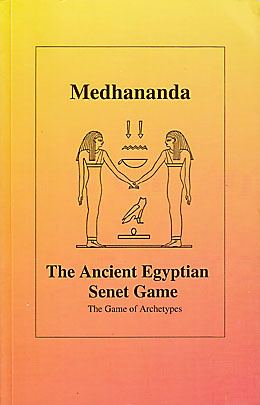 The fifth book, for example, The Ancient Egyptian Senet Game…, deals with a board game, of which several exemplars have been found in ancient Egyptian tombs and recorded by archaeologists. Perhaps it is the most ancient board game known on earth. It is believed to have been played competitively by two players, in a similar way to the common children's game Ludo. On the examples recorded by scholars, each of the squares of the board is marked with a symbol. Medhananda has interpreted these as signalling stages of an inner journey which would culminate in the realisation of the One, the true self and reality dwelling in us and the whole universe. This interpretation may not be as unlikely as it might first appear. Even today in the bazaar of Pondicherry one can buy simple printed sheets showing the game of Snakes and Ladders, which is familiar to children all over the world. In this version, each ladder and snake is labelled in Tamil with a psychological quality, and the entire journey from square one to 100 and beyond is depicted as a journey of spiritual discovery, leading up to the world of the gods, and beyond to liberation. This does not mean that every child who enjoys playing the game experiences it as such. Perhaps most of the Egyptian aristocrats who played the Senet game enjoyed it as a game rather than as a map to self-realisation. Yet it is quite possible that both the Indian and the Egyptian board games were created first as teaching materials by people who were used to seeing the phenomena of the world around them as signs of a deeper underlying reality, in a similar way to the rishis who composed the Vedas with a dual meaning, an outer sense for ordinary people, a profounder one for those who were ready to grasp it. If so, it is also very likely that in the early stages of their use—as far back as 4000 BC—the hieroglyphs carried a symbolic sense which might parallel the early stages of language, as described by Sri Aurobindo, when a single word could carry a very wide range of related suggestive meanings in different contexts. At a later stage in the development of language, the meanings have gradually become more restricted, and the signs too may have come to denote simply phonetic values. The aim of Medhananda and Yvonne was to rediscover the symbolic content of these signs, and of other ancient Egyptian pictorial images, which still seem to speak powerfully across the millennia, even though we cannot quite grasp what they are saying. Medhananda and Yvonne offer us a key to deciphering that message. In his Egyptian studies, Medhananda was not approaching the hieroglyphs and pictures as a scholarly historian, anxious to establish exactly what these images meant to the people who created them. Like his teacher Sri Aurobindo he recognised that it is impossible for us to recapture the precise meaning and connotation that any ancient text had for its original readers. Rather he was concerned about the here and now, about the need to move on from our normal analytic mental processes to discover a deeper significance to all the forms and events of earthly life. He was an ardent practitioner of this search, and an expert at conveying his deeper perceptions with humour and inspiration. Undoubtedly, wherever we can seize human society in what to us seems its primitive beginnings or early stages,—no matter whether the race is comparatively cultured or savage or economically advanced or backward,—we do find a strongly symbolic mentality that governs or at least pervades its thought, customs and institutions. Symbolic, but of what? We find that this social stage is always religious and actively imaginative in its religion; for symbolism and a widespread imaginative or intuitive religious feeling have a natural kinship and especially in earlier or primitive formations they have gone always together. When man begins to be predominantly intellectual, sceptical, ratiocinative he is already preparing for an individualist society and the age of symbols and the age of conventions have passed or are losing their virtue. The symbol then is of something which man feels to be present behind himself and his life and his activities,—the Divine, the Gods, the vast and deep unnameable, a hidden, living and mysterious nature of things. All his religious and social institutions, all the moments and phases of his life are to him symbols in which he seeks to express what he knows or guesses of the mystic influences that are behind his life and shape and govern or at the least intervene in its movements. From his own experience, it was natural for Medhananda to see things in this way. These five books contain his explorations of various sets of ancient Egyptian pictorial images, communicated in an informal story-telling style, intended to make this way of seeing accessible to seekers of today. The books are not scholarly explorations meant to speak to our reason, but teachings intended to evoke a capacity to experience the One in All. Medhananda was a seer and raconteur rather than a writer. The assembling of his insights into a coherent written form was largely due to his co-worker Yvonne Artaud. The original texts which emerged in this way during the 1980s have now been prepared for publication by some of their friends who feel that their lives have been immeasurably enriched by the insights which Medhananda shared with them. They have provided a full scholarly apparatus of notes, references, indexes, and bibliographies. Perhaps in the process some of the spontaneity and charm of Medhananda's original utterances has been lost. While every effort has been made to satisfy the demands of scholarship, in the end each of us has to decide for ourselves how satisfying this approach is. Does it work for us? Does it give us helpful answers to the poignant riddle posed by Life, the Sphinx: "Why is it all, and wherefore are we here?" This will be the test of the lasting value of Medhananda's work. Shraddhavan is the Sanskrit name given by the Mother in 1972 to a young Englishwoman who had left her country to join Auroville. She has been associated with a wide range of educational projects in Auroville, most recently as the Project Coordinator of "Savitri Bhavan". Her writings–poems, stories, essays and book reviews–have been published in Mother India and elsewhere.